Eggplant is one the most beloved, and one of the most common ingredients in Turkish cuisine. So is ground beef. When you put both together in the same recipe, magic happens. No cuisine in the world beats Turkish cuisine when it comes to dishes featuring these two ingredients. 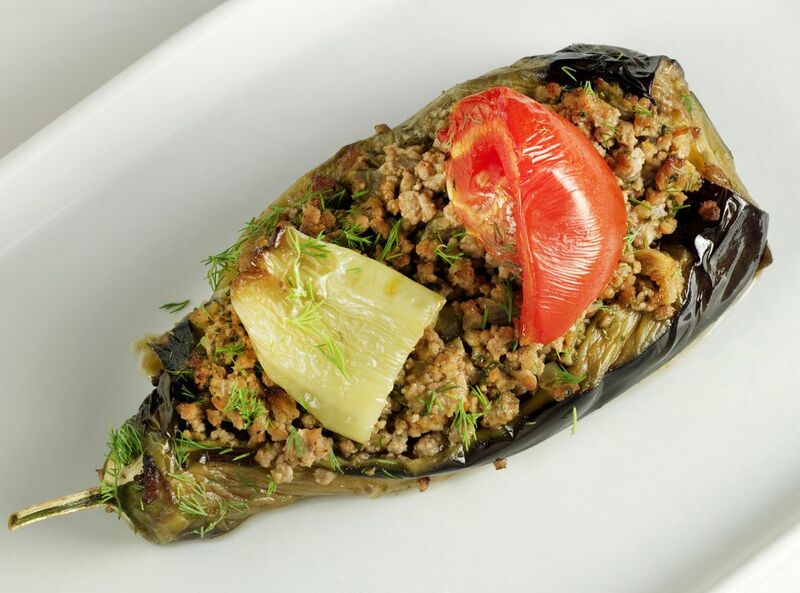 A popular, homestyle dish featuring eggplant and ground beef is called 'karnıyarık' (karn-UH' YAHR'-ruk). Some form of this flavorful, tender dish is prepared in nearly every household throughout the country. Tender, young eggplant are lightly fried to soften them. A meat filling of browned beef, tomatoes, onions and garlic is used to fill the eggplants before they are baked to perfection. If you love eggplant and like to get creative with ground beef, try this Turkish homestyle recipe. Prepare the eggplant. Using a vegetable peeler or sharp knife, peel alternate strips from the eggplant from end to end leaving a striped pattern. Let the eggplants soak in heavily salted water while you prepare the other ingredients. Prepare the filling. Put the olive oil in a large skillet. Fry the onions until they become tender and reduced. Add the ground beef and brown it thoroughly. Using a sharp paring knife, peel five of the tomatoes and dice them into cubes. Once the meat is nicely browned, add the cubed tomato and continue stirring. You can also substitute fresh tomatoes with canned, diced tomatoes. Drain off the juice before adding them to the meat. Add spices and garlic and stir well. Add the chopped parsley Stir the mixture about three minutes more then turn off the heat and let it rest. Drain the eggplants and blot them dry with paper towels. In another skillet, heat the vegetable oil and fry the eggplants whole, turning them to cook evenly on all sides. When the eggplants soften, remove them from the oil and drain them on paper towels. Line up the fried eggplants side by side in an oven-proof baking dish. Using your paring knife, cut a slit from end to end of each eggplant and gently open up each one with your fingers. Fill the center of each eggplant with the meat mixture. Slice the two extra tomatoes thinly, cut each slice in half and place the slices over the filling. Do the same with the peppers. Mix the water with the tomato paste and pour it into the baking dish. Cook the eggplant in a 375 F/200 C oven for about 30 minutes. Remove the dish from the oven and let it rest for a few minutes before serving.